Our round neck sleeveless gown features delicate floral embroidery on the bodice. Soft tatting lace edges the neck and arms. Cool and comfortable sleeveless styling is perfect for the spring and summer months or with a robe for winter. This gown is similar to our 400-4 which features the same beautiful bodice with long sleeves. 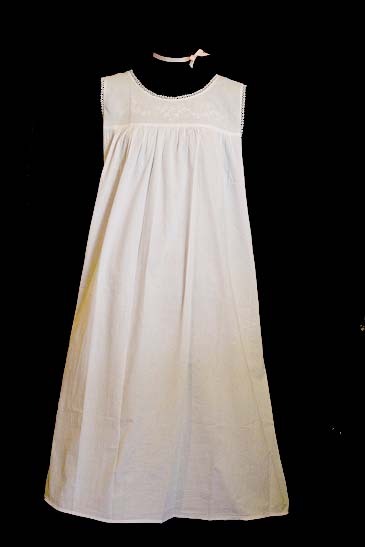 This nightgown is lovely and so well made. The attention to detail and quality is outstanding. I'm 5ft 3in and 115 lbs and ordered a small. Fit and length is perfect. Fast shipping and it came wrapped in tissue and tied with a bow, such a nice touch. I have washed it twice so far using cold wash/ gentle cycle and low temp in dryer. No shrinkage and seems softer with each wash. I will definitely order more nightgowns for myself and for gifts. So glad I found this!